“Sri Lanka is desperately looking for foreign direct investments. But, who will invest, when the ecosystem services that support industry, infrastructure and people’s lives are not assured, and when there is no assurance that the investments are secure from natural disasters?” Environmental Foundation Ltd (EFL) Chairman Dr. Eric D. Wikramanayake queried. Emphasising the importance of restoring forests, he also said that it was vital to restore offshore reefs, and the mangroves, which helped to build resilience against the disasters caused by climate change and exacerbated by man-made actions, that contributed to ecosystem degradation. “Doesn’t it make even more sense to protect what we have already? 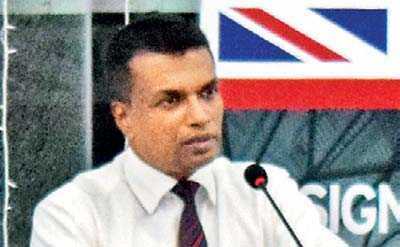 It should actually be an imperative, since it has consequences on national security and stable governance,” he said, at the ceremony to launch the EFL’s book ‘Review of the Southern Border of Sinharaja: contemporary needs against conservation’, held at the British Council Library, Colombo, recently. Sinharaja is Sri Lanka’s flagship for conserving rainforests, and it is the only National Wilderness Heritage area that receives the highest level of legal protection under Sri Lankan conservation laws. Despite its significance, Sinharaja forest is increasingly threatened by potential developments and calamities that occur naturally, triggered by anthropogenic activities. 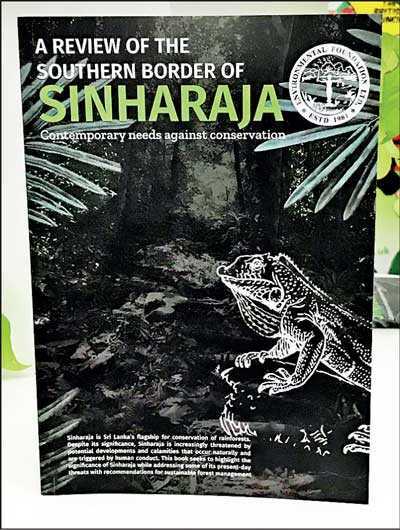 Published by the EFL, the book elaborates a study conducted to assess the present status of Sinharaja, the gaps in conservation and current practices, with emphasis on utilising sustainable forest management as a way of addressing the underlying threats posed to the southern border of Sinharaja. The book is based on a literature survey on the southern border of Sinharaja carried out by the EFL, which had undertaken a consultancy from Rainforest Rescue International (RRI) to carry out a literature survey. Dr. Wikramanayake said that biodiversity conservation is a priority as national economic development was supported and sustained by the natural ecosystems and the goods and services from them. “Therefore, it is crucial that our natural biological heritage is conserved as part of the national economic development plans, especially to build resilience in this era of climate change. Our future is dependent on intact and healthy ecosystems. The science-based evidence is prolific and clear on this,” he said. According to Dr. Wikramanayake, individual citizens, the Government as the custodian of the country’s biodiversity and nature, the private sector corporates that enjoy and reap the benefits of nature and the ecosystem services it provides and which should consider contributions to environmental sustainability as more than a CSR tick box, and the Judiciary that has to enforce the relevant protective measures such as laws and regulations, have significant roles to play in ensuring justice for Nature in Sri Lanka. “We are all accountable and responsible collectively,” he said, adding that the pledges and promises made by Sri Lanka at the Paris Climate CoP in 2015, to increase the country’s forest cover by 30% and reforest 200,000 hectares of degraded lands to build resilience against climate change, have fallen far short, “and there is a greater urgency to act now and catch up,” he noted. Explaining the significant contribution from forests like Sinharaja to build resilience against climate change, he said that severe floods that led to several deaths, loss of livelihoods and damage to infrastructure had cost the Government $ 1.5 billion, the drought that gripped the country again in 2016 had cost $ 1.5 billion, floods in May 2017 had caused death and destruction and there were two severe flood situations in 2018. “But forest restoration has to be done in a strategic way. In doing so, we must also ensure that we conserve our globally important biodiversity – and we have a lot, in the form of endemic species that are only found in parts of Sri Lanka, especially in the rainforests of the south-western quarter and nowhere else in the world. And it has to be done so we can conserve ecologically important and sensitive areas, like the water towers that sustain our water sources, and supporting watersheds so water provision can be regulated,” Dr. Wikramanayake explained. However, he said that unfortunately, Sri Lanka didn’t have a good estimate of the environmental services that the country was benefitting from natural ecosystems in Sri Lanka. “But the economic losses of over $ 3 billion a year due to natural disasters, primarily because of the degradation of ecosystems, can be a proxy indicator of the economic, societal, and governance consequences,” he said. He also said that it was crucial that the country’s natural biological heritage was conserved as part of the national economic development plans, especially to build resilience in this era of climate change. “Our future is dependent on intact and healthy ecosystems. The science-based evidence is prolific and clear on this. But, despite its highly protected status, including as a National Wilderness Heritage Area and World Heritage Site, Sinharaja is increasingly threatened by illegal activities, most of which are driven by actions that benefit individuals, but have very high and significant societal costs,” he stressed. Dr. Wikramanayake said that the purpose of publishing the book was to identify the present conservation policies and laws, and the gaps, to save Sinharaja and other important forests of Sri Lanka from these threats so we can ensure a more sustainable future for Sri Lanka. 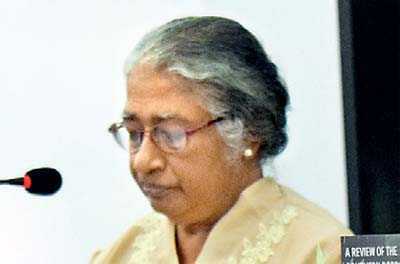 University of Peradeniya Emeritus Professor Savitri Gunatilleke, who is a pioneer researcher in Sinharaja, mainly highlighted the loss of traditional knowledge among the Sinharaja locals, and also those in villages surrounding other protected areas. “This is even true in Desheeya Chikitsa, which is Sri Lanka’s traditional system of medicine that has been passed down from generation to generation over a period of 3,000 years. Over the four decades we - my husband Prof. Nimal Gunatilleke and I, who have been working in Sinharaja - have first-hand experience of the loss of traditional knowledge among successive generations of villagers in Sinharaja,” she claimed. She said that at the inception of their studies in the late 1970s, they were amazed by the wealth of information these locals had on medicinal plants, forest food plants and other utility species, which were used by them for various purposes. “A villager, Seneris, whose home was near today’s forest office in Kudawa village, even had his own collection of medicinal plants in his small home garden. We used this resource and his expertise, to teach part of our field course in Sinharaja in the early years. Sadly as he aged, his medicinal garden was neglected and Seneris passed away this year,” she recalled. She said that presently the indigenous knowledge was only with the older generations in Sinharaja, because the youth were not only moving out of the village, but with the enforcement of protection laws, the opportunity for the younger generations to gain this knowledge was being lost, sadly even to the extent of not knowing how to treat the young inflorescences of Kithul to ensure its free flow of sweet toddy to make jaggery. “This issue could be easily addressed. The buffer zone should not only be a physical barrier to the core area of Sinharaja, but a zone also where the indigenous knowledge of the locals could be conserved for posterity, by bringing the utility species of the natural forest into cultivation in this zone,” Prof. Gunatilleke said. She said that the villagers themselves could be encouraged to enrich their own home gardens with these utility species, which could be raised seedlings of these underutilised species and had a village stall from where visitors could purchase them. According to Prof. Gunatilleke, the indigenous knowledge still preserved among the elders in traditional village communities around Sinharaja and in other such protected areas need to be addressed as an urgent measure, to get it into the country’s science-policy interface to assess Sri Lanka’s state of environment under the Intergovernmental Science-Policy Platform on Biodiversity and Ecosystem Services, which is the global science-policy platform, co-sponsored by UNESCO, UNEP, FAO and UNDP. “Therefore, furthermore, their conservation and sustainable use, as well as the ecosystem services they provide, need to be recognised. Thereby, more enlightened decisions on the sustainable management and use by successive generations could be conserved,” she explained. Conservator General of Forests Anura Sathurusinghe, spelling out the issues that the Forest Department (FD) is facing in restoring forest cover, and the measures taken by the FD to increase the forest cover, said that the Department is to request the Government to change certain land use policies to address the encroachment and non-sustainable cultivation practices that affect the country’s forest cover. “The FD has taken a number of actions to protect and conserve Sinharaja, and the major problem that we are facing is boundary issues, as most of them are being encroached by various people,” he said. Explaining the efforts taken by the FD to increase the forest cover in the country, he said that their main target is to increase the forest cover from the existing forest cover of 25.7% to 32 % by 2030. “This is a nationally determined contribution to the Paris Agreement. Sri Lanka has also pledged to reforest 200,000 hectares of degraded lands by 2030. But finding land for reforestation is an issue,” he noted. However, Sathurusinghe revealed the plan to have plant trees in 30,000 hectares by 2023, under a grant given by the British Government through the World Bank, which is scheduled to commence from 2019. “There may be lots of approaches and mechanisms to be followed. When we started to restore natural forest for the first time in 2015, we had lots of issues, including lack of technical expertise in Sri Lanka but we were lucky to have Prof. Savitri Gunatilleke and Prof. Nimal Gunatilleke, who helped us in many ways with their previous researches on Sinharaja,” he said. The Forest Conservator General said that the success rate is low when restoring highly degraded lands. Most of the lands are available in the dry zone - Monaragala and Ampara districts and also in the Kalutara district. 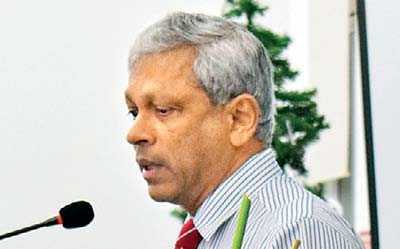 According to Sathurusinghe, the tree cover in Sri Lanka is 60-70 % with home gardens and wet zone tree cover, and 30 % of the tree cover is from home gardens. He also said that the participation of the local communities in replanting the forests, and also looking for home garden systems and also fragmentation of home garden systems were important in increasing forest cover in the country. 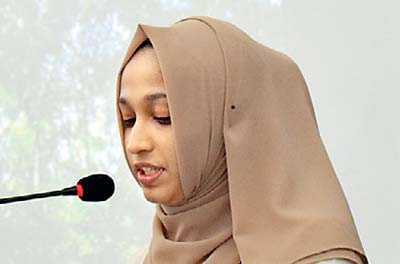 Hafsa Abdul Hudha, the co-author of the book, addressing the gathering said that the nine-month-long research on the Southern border of Sinharaja was done due to their own quest for knowledge, and also the EFL’s undertaking from the RRI to carry out a literature survey to identify the available national and international laws that supplicate conservation, and the development laws that contravene the existing conservation laws. Hafsa and her team visited Sinharaja to carry out a series of interviews with the local authorities, specifically in Neluwa, and also spoke to a member of a local community group for the survey, which is inclusive of both quantitative and qualitative research. “It was during the course of the initial literature survey that we realised that there was a scarcity in the availability of research in terms of science and law. Thus, following our initial survey, we decided to document our findings and compile it into a publication to ease the task of future researchers,” Hafsa, a 23-year-old LLB graduate from the University of Staffordshire, UK, said. The team had worked closely with the FD and Sewa Lanka Foundation, which is working within the peripheral villages of the Sinharaja. According to Hafsa, the book, which contains insightful information, primarily detailing the history of the Sinharaja, discusses conservation and developmental laws in an in-depth and holistic way with highlighting the concerns of climate change and the pressing need for sustainable development. “The main focus here is how we may bridge the gap between conversation and development in a feasible manner,” she said, adding that the fourth chapter is about lack of a veritable buffer zone which has been observed as a root cause for many anthropogenic activities. “Other threats are identified as illegal logging, unsustainable usage of agriculture – to name a few – have also been contemplated. The organisations like RRI and SLF have set up programs where they help manage the issue of unsustainable agricultural usage by educating the farmers regarding organic farming,” she explained. The RRI, funded by the German government and Oxfam, had experimented with organic farming with 750 farmers in the periphery villages of the Sinharaja and it has become a successful project. She said that the farmers had been receptive towards the innovative methodology, and the individuals who had not participated initially had later shifted to organic farming as they have realised the benefits of organic farming. She said that the fifth chapter of the book explained about sustainable forest management, which is the main point that highlighted in the book. “The globally renowned concept is a tailor-made and inclusive approach. Sustainable forest management helps to maintain a symbiotic relationship between mankind and Mother Nature. The chapter expands on the commendable and innovative recourse taken by the Department of Forests in formulating the Sinharaja Forest Complex to protect this unique land better Sinharaja and overcome many threats and hurdles that the forest is currently faced with,” she noted. “The scarcity of resources on the fusion of science and laws was appalling. And this book hopes to counteract that issue, acting as a stepping stone for future research,” Hafsa said. The other co-author of the book is Anushka Gunawardena, and contributors are Piyumani Ranasinghe, Gayantha Wickramarathne and Harindi Palkubura. The books were presented to Conservator General of Forests Anura Sathurusinghe, Prof. Savitri Gunatilleke, British Council Director Gill Caldicott and Justice Shiranee Tilakawardane.